If you consider yourself creative, you've likely considered designing a fancy signature line for your e-mail messages. It's a terrific opportunity to express a bit of your personality without requiring any additional work when composing your message—and without adding extra file size to your e-mail. (Your recipients will appreciate that!) Plus, it makes the e-mail more distinctive, acting almost as a business card, if your recipient wants to print it out. The trick is to know a little about how e-mail works in general, and how to use text formatting to express your identity. E-mail was originally a text-only medium, and some older e-mail programs have limited ability to display pictures, colors, or even specific fonts. In addition, some users have their e-mail client set to display e-mail as text-only. And by text only, I mean black, 12-point type in one standard font from their operating system. This is important to remember when creating your e-mail signature. While most people will be able to view anything you throw at them, many will not. Not everyone has high-speed Internet access, and many people turn off their e-mail client's ability to automatically download graphics. This means that if you use a graphic for your signature (say, a scan of your actual signature), a certain percentage of your recipients will never see it. Instead, they'll see the text that surrounds it—which of course is not what you intended. There are several other important reasons for using text for your signature line. For example, Apple's Mail application and TextEdit are both able to automatically recognize e-mail addresses, phone numbers, and mailing addresses, to help you add them to your Address Book. If you use a graphic for that information, you lose this helpful ability that Apple provides. Therefore, I strongly recommend not including any essential information in graphic-only form. Not only will your message not be received properly, the file size of graphics can make low-speed Internet users angry. The good news is that you can be hugely creative by simply formatting the text of your signature with different fonts, font sizes, spacing, and colors. You can also use symbols from any font to create decorative dividing lines and simple graphic treatments. Here's an excellent example of a very simple but effective signature that uses size, color, tracking, and special characters. Since there's no such thing as "tracking" in e-mail (spacing out characters in text), the example above has a space between each letter, and an extra space between the first and last name. The name is formatted in 12-point Verdana Regular and colored orange. The dashed line is formatted the same way, but in a larger 17-point size—for a thicker line, you could use Verdana Bold. The phone numbers are formatted in 12-point black Verdana Regular, and the bullets are also 12-point Verdana Regular, but colored light purple. A bonus to this design is that if your e-mail recipient has all formatting turned off, it will degrade gracefully to a signature line that is still attractive. Below is a good example that uses Times New Roman, in various sizes and styles, centered by using multiple spaces before each line, with vertical bars between items and a judicious use of color. In this example, the signature degrades fairly well, but because the name was in a larger point size, the lines of type don't quite line up. The above examples use just one font quite successfully. If you want to use more than one font, I suggest limiting your choices to just two. It's better to use color and size to differentiate the parts of your signature rather than additional fonts. Here's one that uses two fonts—Verdana for the company name and Arial for everything else—in multiple colors and sizes. Note the clever use of colored angle brackets in the second line to imply a sequence of services. Also note that rather than using a smaller type size for the less important information, it's simply colored gray instead of black. 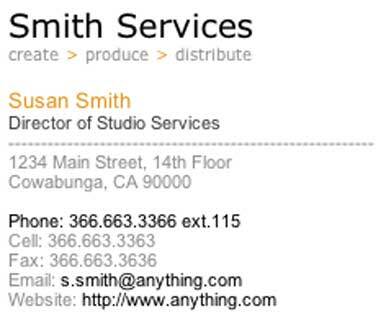 The most important information (phone number, e-mail address, and Website) is colored black instead of gray. Sometimes, only color is needed, as in this example from a "green" supply company. John formatted his name in 16-point Verdana, with his title at 12 points and everything else at 13 points. If you're certain your recipient will be using a Mac, you can try something like the following. Here, the Apple logo is from the Lucida Grande font (which all Mac users have), and all the rest is in Arial regular or italic. Also, to set it off from other text, every line is inset with a few taps of the spacebar. One final design opportunity to consider is using non-text characters, such as asterisks, periods, carets, bars, and brackets, with or without spaces between the characters. These are safe to use, no matter which font, because they exist in all fonts. Feel free to experiment with applying colors to the entire line of symbols or to every other symbol. But be careful when using these symbols—unless you want your signature to look like 1980s ASCII art! If you need a solid line, try a series of underline characters like this. As you can see, there are lots of options for creating attractive signature lines without requiring the use of placed graphics files. The only limit is your imagination and a willingness to experiment with fonts, sizes, colors, and special characters.